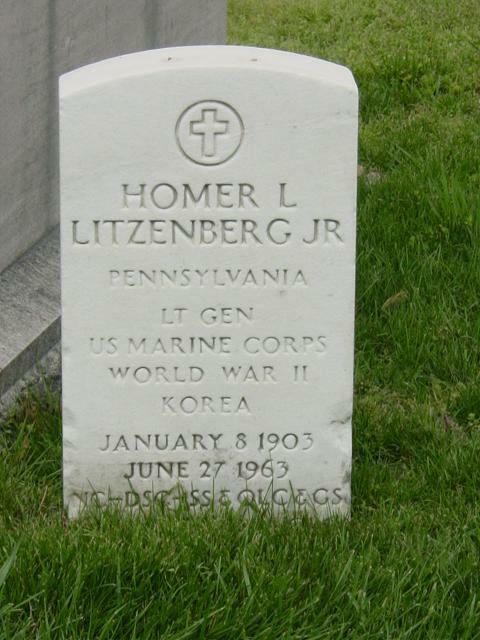 Lieutenant General Homer Laurence Litzenberg, a veteran of more than 37 years of distinguished service including World War II and the Korean War, died 27 June 1963. He had been advanced to his final rank on retirement, 31 May 1959, by reason of having been specially commended in battle. During the early days of the Korean conflict, the general commanded the 7th Marines in the Inchon-Seoul Campaign, at Chosin Reservoir, and during operations in Central Korea. He was the senior officer present when the 5th and 7th Marines repulsed repeated attacks by elements of five Chinese divisions at Yudam-ni, west of Chosin Reservoir, in November-December 1950. His regiment later formed the advance guard of the 1st Marine Division in its advance from Hagaru-ri to the sea at Hungnam. General Litzenberg is a former enlisted man, a graduate of the Parris Island Recruit Depot in 1922. In 37 years of service, he became a military planner of some note and one of the Marine Corps' outstanding leaders in combat. For gallantry in action, he was awarded the Navy Cross and the Army Distinguished Service Cross (next highest decorations to the Medal of Honor), three Silver Star Medals, and the Legion of Merit. The general was born 8 January 1903, at Steelton, Dauphin County, Pennsylvania. After graduating from high school in Philadelphia, he saw two years' service in the Pennsylvania National Guard, and enlisted as a private in the Marine Corps, October 1922 at Philadelphia. Following a tour of duty in Haiti, he was commissioned a second lieutenant 19 February 1925. From 1925 to 1932 he served at various East Coast Stations; on expeditionary duty in Nicaragua in 1928 and 1929; and with Marine Detachments aboard the USS Idaho, USS Augusta, USS Arkansas, USS Arizona and USS New Mexico. After graduation from the Infantry School at Fort Benning, Georgia in 1933, General Litzenberg served for two years as Advisor-Instructor of a Marine Reserve battalion in Philadelphia. He then spent two years in Guam as Aide to the Governor, Head of the Police Department, and Inspector-Instructor of the Guam Militia. From 1938 to 1943, and again from September 1944 to May 1946, he served in Washington in the War Plans Sections of the offices of the Chief of Naval Operations, the Commander in Chief, United States Fleet, and the Joint Chiefs of Staff. When World War II began, he was a major, assigned to Headquarters, Commander in Chief, U.S. Fleet, and served in England during combined planning with the British on the conduct of the war. He also participated in the amphibious assault on Casablanca, French Morocco, in November 1942. After his return to the United States, General Litzenberg organized and commanded the 3d Battalion, 24th Marines, 4th Marine Division. He later served as regimental executive officer during the assault on Roi-Namur, Kwajalein Atoll, Marshall Islands, where he earned his first Silver Star. In March 1944, he joined the Fifth Amphibious Corps as Assistant Operations Officer, and participated in the Saipan and Tinian campaigns. In June 1946, the general was assigned to the Staff of Commander, Seventh Fleet, and served as Seventh Fleet Liaison Officer with General of the Army George C. Marshall and the Chinese Ministry of Defense in Nanking, China, until February 1947, when he became Plans Officer and Marine Officer on the Staff of Commander, Naval Forces Western Pacific. He returned to Washington in August 1948 to attend the National War College, and in May 1949 was named Commanding Officer of the 6th Marines, 2d Marine Division, at Camp Lejeune, North Carolina. At Camp Pendleton, California, on 17 August 1950, he formed and assumed command of the 7th Marine Regimental Combat Team, which sailed for duty in Korea on 1 September. General Litzenberg returned to the United States in April 1951, and was assigned duties at Marine Corps Headquarters, Washington. In December of the same year he was named Legal Aide and Legislative Counsel to the Commandant. Later he served as Director of the Marine Corps Development Center at Quantico, Virginia; as Assistant Division Commander, 3d Marine Division, in Japan; and as Assistant to the Force Commander, Fleet Marine Force, Atlantic. In October 1954 he was named Inspector General of the Marine Corps, and held this post at Headquarters Marine Corps, Washington, for thirteen months. The general served next as Commanding General, Marine Corps Base, Camp Lejeune, North Carolina, from 1 December 1955 until 11 May 1956, and then as Commanding General, Marine Corps Recruit Depot, Parris Island, South Carolina, from 12 May 1956 until 15 March 1957, when he returned to Korea. There, he served as Senior Member of the United Nations Command component of the Military Armistice Commission, negotiating with the Communists at Panmunjom. 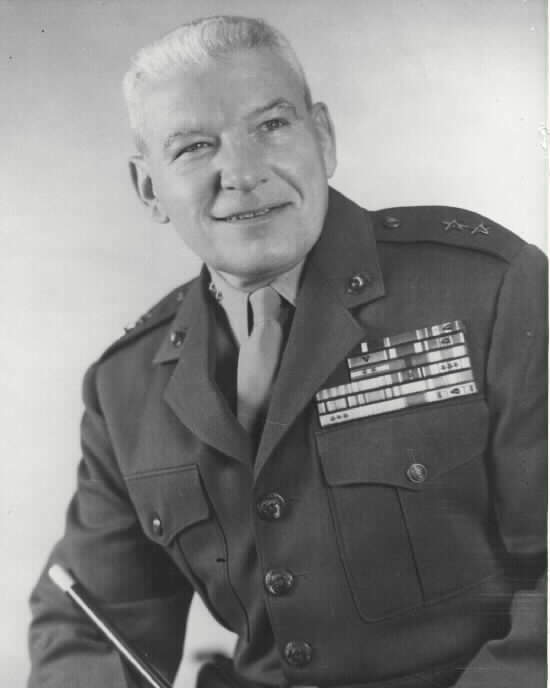 On his return from Korea, he was assigned his last tour of duty at Headquarters Marine Corps on 7 December 1957 as Inspector General of the Marine Corps, serving in this capacity until his retirement on 31 May 1959. General Litzenberg completed the following service schools: Marine Corps Basic School, 1925; Infantry School, Fort Benning, Georgia, 1933; Command and General Staff School, Fort Leavenworth, Kansas, 1938; and the National War College, 1949. His various ranks and the dates on which he was promoted are: Second Lieutenant, February 1925; First Lieutenant, March 1931; Captain, March 1936; Major, June 1940; Lieutenant Colonel, May 1942; Colonel, May 1944; Brigadier General, 1 July 1951; Major General, 1 July, 1954 (Date of rank - 1 July 1951); and Lieutenant General on the Retired List, 31 May 1959. The general's decorations and medals include the Navy Cross; the Distinguished Service Cross (Army); the Silver Star Medal with Oak Leaf Cluster and Gold Star; the Legion of Merit with Combat "V"; the Navy Letter of Commendation; the Army Letter of Commendation with Oak Leaf Cluster (from General of the Army George C. Marshall and the late General George S. Patton); the Presidential Unit Citation Ribbon with one bronze star; the Marine Corps Good Conduct Medal; the Expeditionary Medal; the Second Nicaraguan Campaign Medal; the American Defense Service Medal; the European-African-Middle Eastern Campaign Medal with one bronze star; the Asiatic-Pacific Campaign Medal with three bronze stars; the American Campaign Medal; the World War II Victory Medal; the Navy Occupation Medal; the China Service Medal; the National Defense Medal; the Korean Service Medal with three bronze stars; the United Nations Service Medal; the Special Breast Order of Yun Hui (China); the Order of Military Merit Taeguk (Korea); and the Korean Presidential Unit Citation. As a Major, Homer L. Litzenberg was assigned to Headquarters, Commander-in- Chief, U.S. Fleet, and served in England during combined planning with the British on the conduct of the war. He also participated in the amphibious assault of Casablanca, French Morocco, in November 1942. General Litzenberg was born in 1903 and began his service in the Marine Corps as an enlisted man. In 37 years of service he proved himself to be a leader in combat with the award of the Navy Cross, the Army Distinguished Service Medal, three Silver Star Medals, and the Legion of Merit. He served with the 24th Marines in the Marshall Islands and the V Amphibious Corps in the Saipan and Tinian campaigns. As commander of the 7th Marines, he went to Korea on 1 September 1950, and led that unit in the Inchon landing and the Chosin Reservoir campaign that followed. Subsequently, Litzenberg served as the base commander of Camp Lejeune, and then as Commanding General, Marine Corps Recruit Depot, Parris Island; senior member of the Military Armistice Commission in Korea; and Inspector General of the Marine Corps, before his retirement on 31 May 1959. He died on 27 June 1963. Then-Lieuenant Colonel Homer L. Litzenberg served on the staff of Task Force commander, Rear Admiral H. Kent Hewitt, in Operation Torch, the invasion of North Africa. He later served with the 4th Marine Division in the Pacific War and retired after the Korean War as a Lieutenant General. The President of the United States takes pleasure in presenting the Distinguished Service Cross to Homer Laurence Litzenberg, Jr. (0-3959), Colonel, U.S. Marine Corps, for extraordinary heroism in connection with military operations against an armed enemy of the United Nations while serving as Commanding Officer, Seventh Marines, First Marine Division (Reinforced), in action against enemy aggressor forces in the Republic of Korea from 29 November to 4 December 1950, in the vicinity of the Chosin Reservoir, Korea. Colonel Litzenberg's actions contributed materially to the breakthrough of the Seventh Regiment in the Chosin Reservoir area and are in keeping with the highest traditions of the military service. The President of the United States takes pleasure in presenting the Navy Cross to Homer Laurence Litzenberg, Jr. (0-3959), Colonel, U.S. Marine Corps, for extraordinary heroism in connection with military operations against an armed enemy of the United Nations while serving as Commanding Officer of the Seventh Marines, First Marine Division (Reinforced), in action against enemy aggressor forces in the Republic of Korea on 6 and 7 December 1950. Confronted with tremendous difficulties imposed by several days of continuous fighting in subzero temperatures against a numerically superior enemy force which had severely depleted his Regiment, Colonel Litzenberg unhesitatingly proceeded to carry out his orders to attack from Hagaru-ri to Koto-ri and to join other units there. With the only route of attack blocked and strong elements of two hostile Divisions holding positions to his front and flanks, he skillfully directed his assault from a position exposed to vicious enemy artillery, mortar and machine-gun fire. Expertly supervising the care and evacuation of casualties and moving tirelessly among his men to inspire and exhort them to heroic efforts, he finally succeeded in pressing through to his objective with an offensive so devastating that the enemy was unable to recover rapidly enough to deliver concerted attacks against the flanks of the rear guard Regiment which followed his unit. His great personal courage, daring initiative and indomitable fighting spirit in the face of overwhelming odds reflect the highest credit upon Colonel Litzenberg and the United States Naval Service.